Happy Monday bookworms! I hope everyone had a wonderful weekend – it is always a little sad to head off to work on a Monday morning – back to the grind! I had a great bookish weekend – I finished up three books, organized my living room bookshelves and started two new books! For new books, I started The Rules of Magic, by Alice Hoffman (the prequel book to Practical Magic) and The Echo Killing, by Christi Daugherty, which is an e-ARC I received from the publisher, Minotaur Books, in exchange for an honest review. 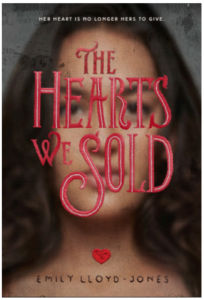 Today I wanted to review The Hearts We Sold which is one of the books that I finished up this weekend. The author for this book is Emily Lloyd-Jones and I received this book as part of one of my OwlCrate boxes. If you have never heard of OwlCrate, it is a YA book subscription box that you receive monthly that has one new release hardcover YA book along with a host of other bookish goodies and merch. It is a super fun way to bring new, surprise books into your life every month! Okay, so back to THWS, this book surprised me! It is a very fun, quick YA fantasy book set in an ‘our world’ Portland, Oregon, where demons have shown themselves to exist and now make ‘deals’ with humans for a variety of different purposes. I really enjoyed the main character, Dee, who had some struggles but was on the way to finding her freedom and herself. She feels compelled to make a deal with a Daemon and trades away her heart – hence becoming one of the ‘heartless’. “She had walked willingly into a fairy tale, into a world where she could trade her heart for her freedom. She may as well have donned a red cloak and strode into a darkened forest. She had always known there would be wolves. Do you read YA fantasy books? If so, what are some that you would recommend? I would love to hear!